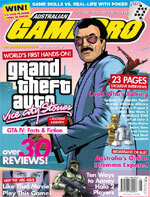 Chris Stead (editor of GamePro Australia) has just informed users at GTAForums.com that his magazine will have all of the first details (plus shots) of GTA:VCS when it goes on sale tomorrow. Fortunately, JarJar was able to get his hands on an early copy. The main character is Victor Vance, Lance's brother. In GTA: Vice City, Victor is killed by Diaz's goons at the very start of the game when a deal is ambushed. He is a 28 year-old US Marine. GTA: Vice City Stories is set in 1984, two years before GTA: Vice City took place. Cutscene animations are said to be more life-like. There are many familiar landmarks which only appear half-built due to the timeframe. Vice City Stories will feature multiplayer similar to Liberty City Stories. Vice City Stories features the ability to swim. All of the radio stations from GTA: Vice City will return, "loaded with a new set of killer tunes". Helicopters and jet-skis will both feature. GamePro also got the chance to preview several missions..
Mission 1: "Say Cheese" - Victor is after some etxra cash, and there is a job available over at the Film Studios on Prawn Island. They are filming a chocolate commercial and require a stuntman, so your task is to drive around the bay using a jet-ski while a helicopter above - with camermen on it - obtain all the footage they need. Afterwards you must jump onto a waiting motorbike, and continue the chase into the heart of the city. Mission 2: "Jump Ship" - We learn that Brian Forbes, an associate of Vic and Lance, is an undercover cop. Lance kidnaps him and beats some useful information out of him. There's a drug deal taking place down at the docks, and Lance needs you to watch his back for him. The brothers goto a rooftop nearby, where you must pickup binoculars to spy on their activities. Lance screws it up, and the dealer escapes on a speedboat with the kidnapped Lance. Get in the sports car and give chase - the car physics have been improved significantly. The chase eventually leads to a large moored tanker, where a shootout takes place and you must rescue Lance. Mission 3: "Taking the Fall" - This mission is similar to Phnom Penh '86 in (GTA: Vice City) except this time your role has been reversed - you're flying the chopper while Lance acts as the shootist. You must fly low in the chopper and hold it steady while Lance takes out a local biker gang. Eventually Lance finds himself down on the ground, surrounded by a group of bikers. Mission 4: "Turn On, Tune In, Bug Out" - In this mission you must buy a rocket launcher and take out the recievers at the cop shops across town. Car sections, helicopter flights and heavy explosions are all a part of this mission. There didn't appear to be any evidence of car customisation, nor the ability to climb walls. Trip-skips are back, where taxis return you to your last mission post-death. Loading times during the exterior-interior transition are a lot quicker than in LCS, and loading times in general have improved. There is an activity called the "Chunder Wheel". Jumping on for a ride puts you in first-person perspective. The draw distance has improved yet again..
Vice City Stories features more interiors than Liberty City Stories.. Car and environment damage have been improved. Victor Vance made his first appearance in the GTA series at the beginning of GTA: Vice City. There was a deal going down by the docks, and the Vance brothers were one of the parties involved. The deal was ambushed however, and Victor failed to make it out alive. In GTA: Vice City, it is implied that Lance does not always get on with his brother. Lance said that Victor would "patronize" him and "treat him like a little kid". Victor is head of the Vance Crime Family, which consists of only two members - him and his brother. Jordan from our partnersite PlanetGrandTheftAuto has posted an article that gives a background on the Vance brothers, so be sure to check it out. Jordan has also uploaded the GTA: Vice City intro movie, which contains the only scene in the game where Victor Vance is present. Click here to watch it.